We recently had a staff recruiting spree and one of our newest members, Moon Pearl, also known as Succubi Samus, has been given the Lead Artist position! If you are fan of her work, you might know how she loves to mess with plots. As a writer I certainly can admire that! Our first full release of the reference sheets we’ve had them do is Shadowstrike aka Rainbow Dash! As you die hard followers know she’s an homage to both Robin and Daredevil and uses echolocation like the latter. Blinded by the intense light of the explosion, Dash used her free time not to mope around but just learn to be as Awesome as she wanted to be despite her disability! It wasn’t until years later when her powers manifested that she became the coding expert of the night, Shadowstrike! Stay tuned as we release more slowly, its hectic around the discord server with so many new people and structure to boot, so until next time! As of August 26th, 2018, two members of the project are no longer associated with the project! We wish them the best in any en devours they peruse! Took in several new members to the team in all departments! Can’t wait to share more! Here’s a few previews of the latest sheets we’ve gotten in from some of the new staff! This week we have a lot to update on so let’s get down to it! Our spinoff series Equestrian City: Side Streets is progressing nicely. I have high hope’s we’ll be ready to release story one “A Bed of Your Own Making” this week! The regular series episode 10 is in the middle of proofreading and re-editing and I’ve had our editing staff prioritize the side project for now to get the new short story out. No worries though hopefully we’ll get a new addition to the editing team. Any inquires can be sent via twitter or dm on the site you’re reading this on! Always looking for help! Our eternally awesome Wubcake has expressed interest in helping us get the fanfic dramatic reading off the ground! Hopefully we can get a taste of things when she brings the newest short story to life! Our Patreon is up and very lonely but that’s to be expected as we’re obscure! Don’t forget to at least glance over the idea of supporting us! Being able to provide help and support is vital to help us keep rolling. I finance most of this from my own pocket and it’s becoming a bit overwhelming financially. We’ve got a new piece of concept art in from the spectacular LegendarySpider! Some of you may know him from dA or tumblr. Perhaps even derpibooru? He’s a fine artist and a gem to have around the server when were all brainstorming ideas. Couldn’t do a lot of this without him! I know Joanna appreciates his help too! 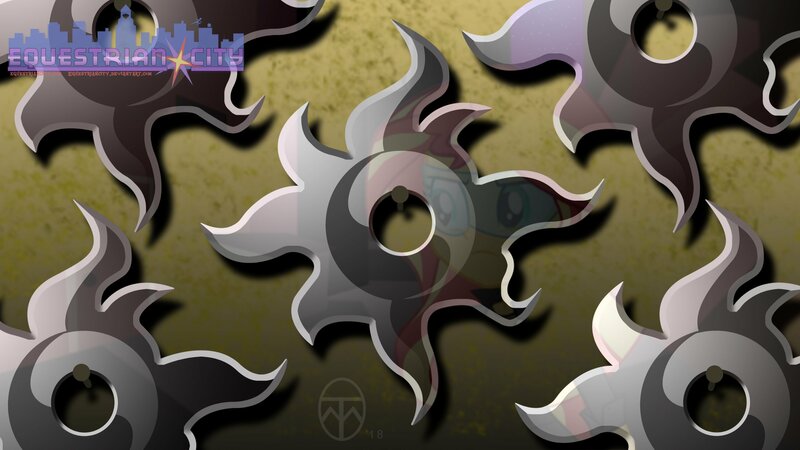 The piece in question is Sunset’s primary ranged weapon when not tapping into her powers! As she was inspired by Batman no less fitting is it that she get a sunsetarang! Not the final name but you get the idea! Speaking of Joanna she’s hard at work on the Shadowstrike / Rainbow Dash reference sheet. A slave to her own perfection she’s meticulously trying to replicate the shows look while adding her own flair to it! Our Discord server is open to any and all interested in sharing our crazy space. We discuss the project and we have regular zany conversations when we get sleepy. So if you’re a fan and want to hang out and maybe even help, drop me a line! Finally let me remind anyone reading this that as massive as this project is it’s always and forever shall be a fan made project. As such we don’t knowingly tend to profit from any of this but we do have real life interfere at times. That being said we appreciate hearing from each and everyone of you and don’t be afraid to drop a line or a post!